Yeah, I forgot the RAM actuation. It makes sense now. So will you be machining a completely new, bigger valve for this? I'm still a little confused on how the RAM actuates plus air goes through it and fires, because it seems totally different than the ABP5K. Edited by Prometheus, 22 October 2007 - 11:30 PM. 1. So will you be machining a completely new, bigger valve for this? 2. I'm still a little confused on how the RAM actuates plus air goes through it and fires, because it seems totally different than the ABP5K. 1. I can use the same valve design. I will simply swap which port leads to the barrel because that one provides a much higher flow rate. 2. The trigger valve is linked to the barrel directly via tubing leading to a ported jacket that fits onto the barrel. The barrel has some vent holes drill in it. I'll make a diagram of this later. But basically the ram doesn't link the trigger valve to the barrel. All it does is load the dart and seal off the back of the barrel. I think I get it. The actual air flow comes from a port on the side of the barrel, the RAM seals the back after loading a dart in. Well, the tube magazine was proving to have too low of a round capacity for me to be satisfied with it. And I had wanted to design a shorter weapon than abp5k. So I decided to try two things I've been interested in doing. the staggered magazine should have a 20 dart capacity. And to make the magazine easier to make I've design the follower so that it's loaded from extension springs rather than a box compression spring. Total length: 19 inches from tip to stock. And completely ambidextrous to boot. Edited by CaptainSlug, 23 October 2007 - 06:19 PM. Your burning through the ideas faster then I can keep track. Pick one already. I am amazed at how many you have come up with so far. I have thought about a bull pup for a few days now. I havn't decided how to go about it yet, but its somehting I plan on doing at some point. How does this staggered mag work exactly. I don't know how your planning on doing it with out shells. Seems there is a feeding problem waiting there if the darts get mushed, if it works the way I think it will. First off I wish you the best of luck on completing this. Just wondering, are you still going to use an paintball airtank? Also how does a staggered magazine work? It works the same as any staggered magazine, with a lop-sided follower and a lightly sloped top to force the darts back to single file. If it doesn't work I simply have to remake two pieces. And the impetus behind this configuration is partly because the air cylinder I need in in the parts bin at work. It pretty much works the same as the other designs in this thread, but the air cylinder in this case has an extension on it, and it retracts to pull the ram into the barrel. This arrangement saves a lot of space. I also just added the option to adjust the grip forward/back by about 2-1/2 inches by simply pulling out a quick-release pin. Edit: Magazine design needs some refinement. I'm trying to use patents as reference. Yes this gun is generally meant to be used with a paintball tank. Edited by CaptainSlug, 23 October 2007 - 10:42 PM. Thank you now I understand it. Also will this be easier to fabricate then the abp5k, like will an average machiner be able to do it? The valve and ramrod are the only parts that would require the use of a lathe (to get the drilling done clearly and perfectly straight) but those parts are simple and I might be willing to make duplicates at a later date. 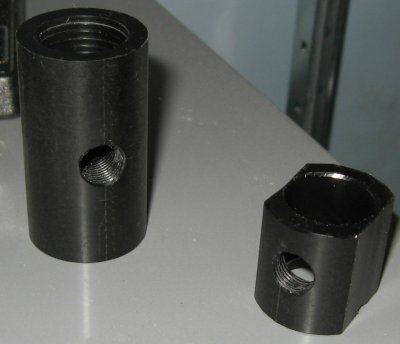 The rest of the parts generally should be very easy to make if you have a drillpress, scrollsaw, and a #6-32 tapping bit. The part count and complexity is generally much lower than ABP5K because I'm trying to save myself some time, while still keeping the design robust and innovative. I don't want to have to lathe my own spacers this time around. I'm still working on designing features I would like to try. I'll see if I can pull them off the way I want to. CaptainSlug, I will add this to the homemade directory as soon as you start construction. The follower or carrier or what ever you want to call it in the magazine will work better if it is shaped to the darts, so that means curving it. I know it would be a pain but it will feed better if it acctually sits with the darts affectively. Thats how staggerd pistol mags work atleast. I'm currently working on a design for a speed-loader system. 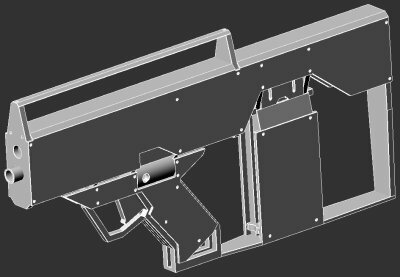 Basically a lock-down for the follower and a door that will allow you to dump 15 darts into the magazine then close it again. You're right. At the very least it has to have an angle added to its cross-section profile so that the last dart you advance can make it over the lip. Edit: I think the design work is mostly done now. The follower can be locked in it's lowest position and either side of the magazine can be slid down to allow multiple darts to be loaded quickly. This means that you have more options for reloading the gun than simply feeding one in at a time. Edited by CaptainSlug, 24 October 2007 - 08:07 PM. If you acctualy curved it to the dart, it would save the trouble of smashed darts and end up fixing it latter. But I'm really digging they Bullpup design. For nerf, bullpup is perfect. there is no chanche for the darts to blow up in your face as with real guns. But really nice design. And I know its wishfull thinking but hope you get your guns back. putting a rounded fillet on it would be really hard to accomplish with basic tools (and where I work doesn't have any ball cutters for the mill that are the right size), so I think a 45 degree slope will have to do. 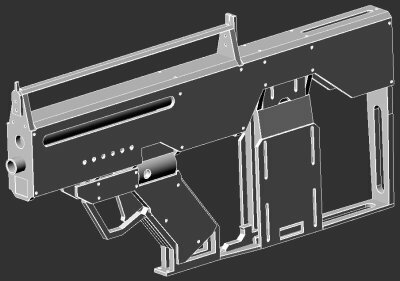 The first parts I will make will be the magazine assembly, since that assembly is what will require some testing. Edited by CaptainSlug, 24 October 2007 - 08:09 PM. Why the hell would you need a massive muzzle break for a weapon that fires 5.56? 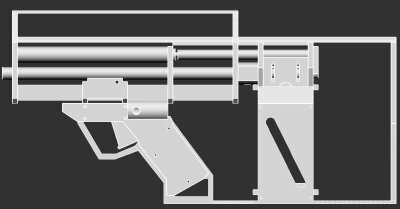 The gun is going to look however it's going to look based on the design requirements that lead to the end configuration. Whatever styling added after than will be there just because I want it. I don't want to make something for the sake of making it to look like something else. I want it to stand alone on its own technical merit and usability. If it looks cool while doing those things then all the better. As for a foregrip, this time around that's something I would prefer to figure out after the gun is made so I know where it will be needed. This one (in my opinion) should be much more war capable than abp5k would have been. ABP5k was primarily an experimental platform to allow me to determine performance baselines for future guns. Unfortunately since it's now missing somewhere in Canada I don't have a platform to continue with tests. So I want to make a new platform, but this time around with all the revisions I was hoping to make to abp5k, already built into the design. Edited by CaptainSlug, 25 October 2007 - 12:54 AM. I think the mentality is similar to painting flame decals on cars. Just as flames make a car go faster, a massive muzzle break will make the bullet go further, faster, and more accurately hit its target. I can't imagine a non-hobbyist wanting a few Nerf guns and a tank instead of his/her own stuff back. I'm sure you'll get them back someday. I would check eBay & Craigslist just in case though. Edited by n-Lord, 25 October 2007 - 11:07 PM. Yes I have seen that. And no I do not really want air to be channeled through the ram because doing so would make the gun quite a bit longer or a good deal more difficult to make. I'm going to keep things simple (relatively for me anyways) until I have more proven designs to build later designs upon. Prior to completing ABP5k there were TONS of unknowns. I had no idea what the optimum volume of a blast chamber was, how wide any given air passage needs to be to provide enough airflow to fire a dart, and whether or not I could get an air cylinder to actuate a breech effectively at lower pressure levels than it was meant to. I don't intend to aim for the moon when I haven't even been able to launch a rocket yet. Air powered homemades are very unexplored territory so it's going to have a fairly steep learning curve with a good deal of experimentation needed along the way. Edited by CaptainSlug, 26 October 2007 - 12:05 AM. Good point i picked up some inherit flaws with that 6mm semi design anyway. I got the valve body and barrel sleeve made yesterday. I need to take inventory of my plastic and wait for a mcmaster order arrive and then I can start making the rest of the gun. It was the closest representation of my thought that I could find. Keep in mind that I didn't create it. However, I was pointing out the features more than the overall look. For a more practical design, it may be better to have a grip for your other hand for more steady aiming, and some form of rail system should you want other attachments later. It was simply a suggestion based on the CAD prototype design that you had made earlier. This looks really promising and, if it works, it's probably be the first functional bullpup nerf rifle. Although I would really opt of some kind of forgrip or a place to rest your non-shooting hand so you can avoid problems as to where to put your other hand (firefly).